Alfred McCoy’s newest book concludes with five scenarios for the potential end of U.S. global hegemony. The book was McCoy’s topic as guest speaker at the annual Veterans for Peace May 28 afternoon rally at the Gates of Heaven. McCoy’s sobering, realistic, and carefully researched presentation described historical evidence of empires built and undone. While identifying aspects of a declining “American Century” [of U.S. hegemony] as signaling an end to an American Empire, he also noted positive results of the “American Century” including formation of the United Nations and the World Health Organization, and global advances in human rights. In the Shadows of the American Century: The Rise and Decline of U.S. Global Power, (Haymarket Books 2017) is McCoy’s newest book. He wrote to end the final chapter, “Now that the American Century is ending, we can only wonder what kind of shadow it will cast across the globe for future generations.” His presentation at the peace rally posed a similar question. Sharing the peace rally program was Progressive magazine publisher Norman Stockwell, who told the audience of more than 100 about his recent return trip to Vietnam and the ongoing efforts and successes of Madison Quakers Inc. (MQI) and director Mike Boehm. Micro-credit loans, compassion houses, primary schools, My Lai Peace Park, and drilling of water wells are among projects headed by Boehm and MQI over the past decades in Quang Ngai Province. Father David Couper is an ordained Episcopal priest, author, former Madison police chief and member of Veterans for Peace. Couper spoke during the peace rally about his path to nonviolence, and ended his invocation with a poem. During the program, seniors from six area high schools were honored as winners of 2018 cash scholarships in the Chapter 25 essay contest. Since the program began 11 years ago, close to 200 student essays have been submitted by scholarship applicants from high schools in Madison, Spring Green, Dodgeville, Muscoda, Richland Center, Baraboo and Boscobel. Student essays are written on topics of peace and nonviolence. Attending the peace rally and introduced by VFP member Paul McMahon was the 2018 winner from West High School, Diana Nava. She was accompanied by her mother, Julia, younger brother, Alex, and a friend. Scholarship recipients from other schools in 2018 are: Lily Scallon, Boscobel High School; Nichole Erdman, Dodgeville; Miles Statz, Baraboo; Garrett Prem, River Valley; and Cole Darling, Richland Center. 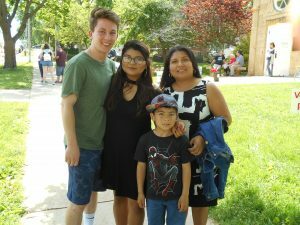 Diana Nava, 2018 Madison High Schools scholarship winner, and her family. Photo by Tom Glassel. Members of Veterans for Peace who have died were named and remembered fondly, including: Clarence Kailin, Joey Camarrano, Jim Ellsworth, Sidney Podell, Dr. James Allen, Jeff Goldstein, Charles Sweet, Dr. Eugene Farley, Joel Gaalswyk, John Oliger, and Ed Garvey. The rally began with a stirring set of music by the band Old Cool. Band members are Dan Hildebrand, Sandy Nowak, Arvid Berge and Lee Grady. 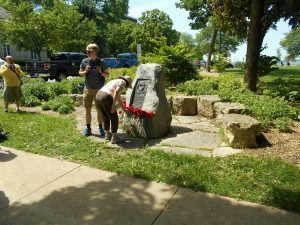 Ending the event was Sean Michael Dargan’s bagpipe music while attendees placed red carnations at the nearby monument to Wisconsin Lincoln Brigade volunteers fighting Fascists in 1937 during the Spanish Civil War. Clarence Kailin, namesake of Chapter 25 Veterans for Peace, was a member of the Lincoln Brigade. His name is listed on the marker. Clarence died in 2009 at age 93. Attendees place carnations on the Abraham Lincoln Brigade monument in James Madison Park. Photo by Tom Glassel. This entry was posted in Clarence Kailin Chapter 25, Madison Area Technical College Scholarship, Madison College Scholarship and tagged Alfred McCoy, Alfred W. McCoy, Baraboo, Boscobel, Charles Sweet, Clarence Kailin, David Couper, David Giffey, Dodgeville, Dr. Eugene Farley, Dr. James Allen, Ed Garvey, Jeff Goldstein, Jim Ellsworth, Joel Gaalswyk, Joey Camarrano, John Oliger, Madison College, Madison Veterans For Peace, MATC, Mike Boehm, Richland Center, Robert Veith, scholarship, Sidney Podell, VFP on June 6, 2018 by Website Administrator.